To get a quality injection molded part, besides a quality mold, you need to know how to setup the process working condition correctly, optimum working condition setting provides the minimum cycle time, lower scraps rate, stable performance and quality parts, a complete injection molding process includes: filling stage, compression stage(packing), holding pressure stage, cooling stage, ejection. There are three major elements to consider to setup a correct working condition: temperature, pressure time. Melt temperature is one of the most important factors in plastic molded parts, higher melt temperature can improve the mold flow condition, but if it is too high, the resin could degrade. Usually the resin supplier will propose the appropriate melt temperature along with the spec sheet of the resin. Part cooling is determined by injection mold temperature setting, maintain even mold temperature can eliminate defect like molded part deformation, usually water is used as coolant. The injection mold temperature can be measured by using a thermometer. The average cavity surface temperature will be higher than the temperature of the coolant during production. So you should set the coolant temperature to be 10º to 20ºC (18º to 36ºF) lower than the required injection mold temperature, if the injection mold temperature is 40º to 50ºC (72º to 80ºF) or more, consider insulation plates between the mold and the clamping plates, for energy savings and process stabilization. Use the lowest temperature setting to achieve the shortest cycle time. However, you might try using higher temperatures to improve the appearance of the part. A higher injection mold temperature produces a higher gloss and more crystallization. During plasticization, back pressure is needed and recommended about 5-10MPa. The injection pressure should be as low as possible to reduce part internal stress. Then set the holding pressure at 0 MPa, so the screw will stop when it reaches the switch-over position. See below figure about the whole process. Filling starts from the resin plasticization to the melt filled into the mold cavity, after the filling process done, it needs time to wait the gate or the part to be frozen. Cooling time take a major part of the production cycle, this is why the optimum cooling system design is critical during mold design stage, sufficient cooling design can contributes a lot to mold productivity. The mold open time is usually set at 2 to 5 seconds. 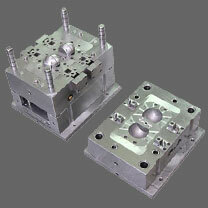 This includes mold opening, ejection of parts from the mold, then the injection mold closing. The injection molding cycle time is the sum of the filling time, cooling time, and mold open time.